This is a dream come true for us! 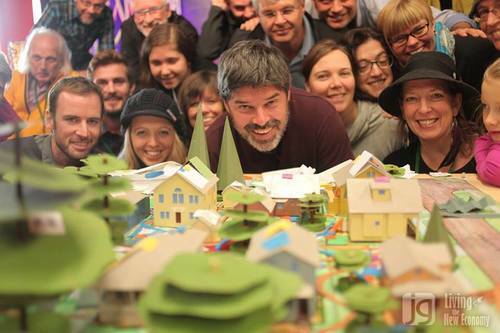 We are excited to bring Portland’s City Repair Founder, Mark Lakeman, and his collegue Kirk Rea, to Akron for a very special GAINS – Greater Akron Innovation Network for Sustainability meeting, hosted by Big Love Fest, this March. Mark Lakeman is a pioneer in the reclamation and development of regenerative public places. In the last decade he has directed, facilitated, or inspired designs for more than three hundred neighborhood-led designs in public places in Portland, Oregon alone. Through his leadership in Communitecture, Inc., and its various affiliates such as the The City Repair Project, The Village Building Convergence, and the Planet Repair Institute, he has also been instrumental in the development of dozens of participatory organizations and urban permaculture design projects across the United States and Canada. Mark works with governmental leaders, community organizations, and educational institutions in many diverse communities. Kirk Rea specializes in social equity and placemaking. Kirk works in allyship with other marginalized peoples using his visual art, community building, and permacuture background to engage in activism and advocacy. Volunteering with City Repair since 2011, Kirk also works as a affordable housing advocate and garden educator with the Portland Community Reinvestment Initiatives (PCRI). Please sign up on Eventbrite so we know how many people to expect! It only takes a minute!